The event was emceed by well-known Pittsburgh public TV personality and Slovak-American, Rick Sebak. The national anthems of the Czech Republic, Slovakia, and the U.S. were sung by local Czech and Slovak young people’s groups, and Bishop David Zubik of the Diocese of Pittsburgh gave the invocation. 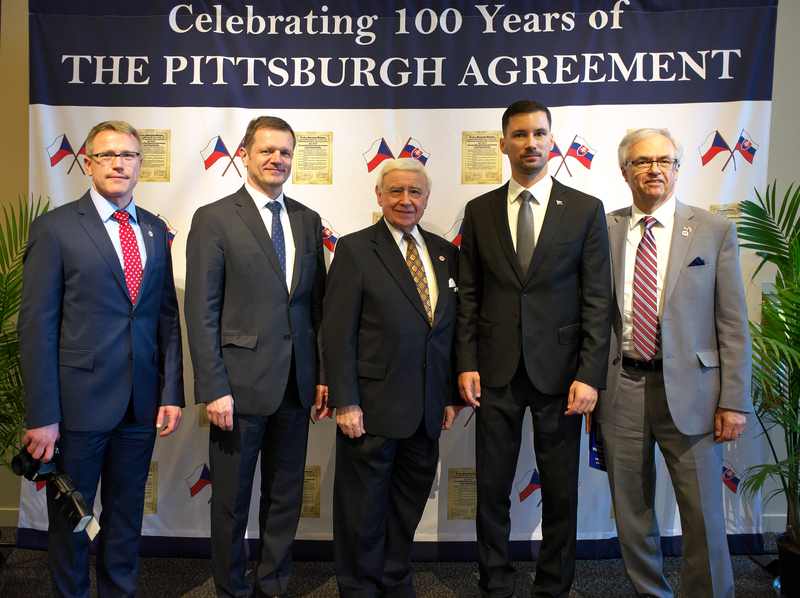 Local officials, including Pittsburgh Mayor William Peduto welcomed the attendees, and spoke of the influence that Czech and Slovak immigrants had on the social and economic development of Pittsburgh and the United States. Honorary consuls (and FOS Chairman) Joseph Senko (Slovak) and Carol Hochman (Czech) then introduced the guests from the Czech and Slovak governments. The ambassadors of each country, Peter Kmec (Slovakia) and Hynek Kmonicek (Czech Republic) then spoke, with Amb. Kmonicek noting that despite the ‘Velvet Divorce,’ Czechs and Slovaks can never be foreigners to each other. 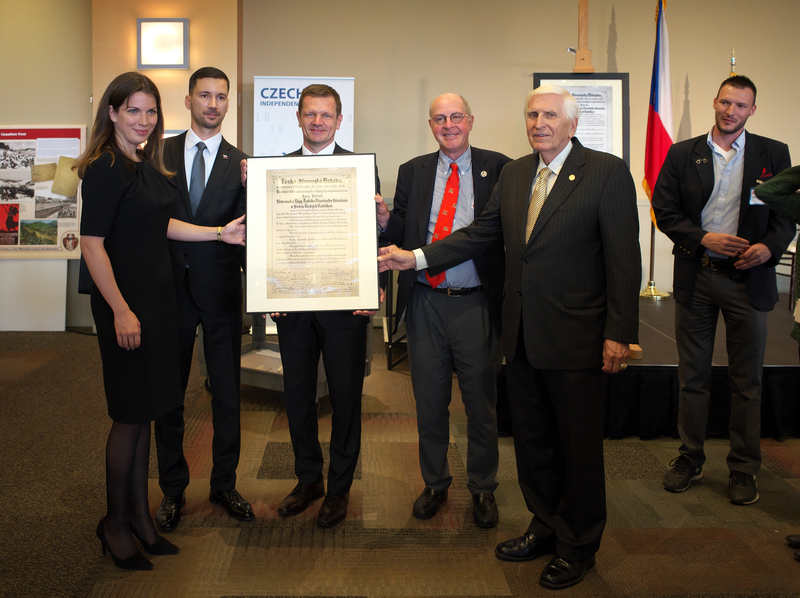 Government officials followed, with Miluse Horska, Vice President of the Senate of the Czech Parliament, speaking about the significance of the Pittsburgh Agreement for the history of Czechoslovakia. Next, Slovak government officials spoke: Katarina Csefalvayova, Chair of the Foreign Affairs Committee of the National Council of the Slovak Republic, and Lukas Parizek, State Secretary of the Ministry of Foreign and European Affairs. 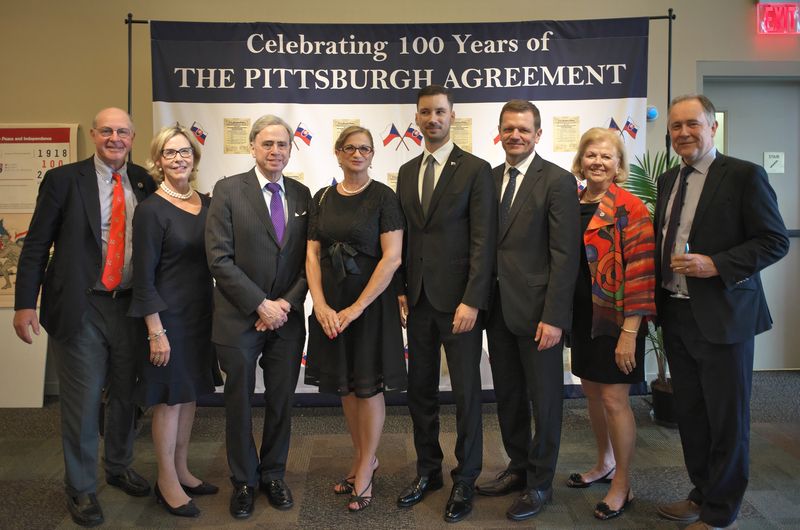 Both echoed comments about the significance of the Pittsburgh Agreement for the development of the Slovak nation. Ms. Csefalvayova in particular, looked to the future and spoke of the need for continuing vigilance in the face of current threats to democratic values. 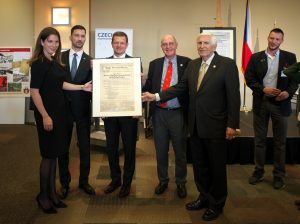 Left to Right: Richard Marko, FOS Board Member; Peter Kmec, Slovak Ambassador to the U.S., Joseph Senko, Slovak Honorary Consul and FOS Chairman; Lucas Parizek, State Secretary of the Ministry of Foreign and European Affairs of the Slovak Republic; Ken Bombara, FOS Vice Chairman. 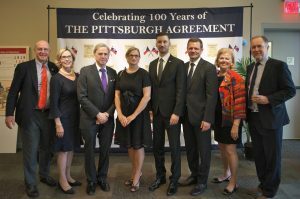 Earlier that same day a symposium, organized by American Friends of the Czech Republic and co-sponsored with FOS, focusing on the historical background of the Pittsburgh Agreement, was held at the University of Pittsburgh. Speakers included: Prof. Milada Polisenska, of Anglo-American University, Prague; Mgr. Matej Hanula, Institute of History of the Slovak Academy of Sciences, Bratislava; and Dr. Hugh L. Agnew of George Washington University. Among the topics discussed were the roots of the “centralists vs. autonomists” debate that involved Slovakia, and that eventually led to the Velvet Divorce in 1993. 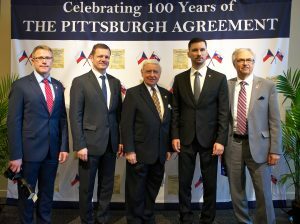 Click here to view a video of the Pittsburgh Agreement symposium. 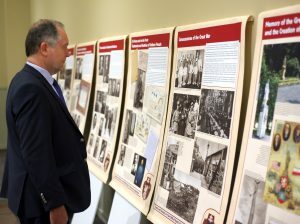 Pavol Demes, Transatlantic Fellow, the German Marshall Fund–Bratislava, views panel exhibit. Left to Right: Tod Sedgwick, former U.S. Ambassador to Slovakia; Mary McPherson, President and CEO, Slovak American Foundation; Frederick Frank, Chairman, Sovak American Foundation; Maria Hurajova, Vice Chairman, Slovak American Foundation; Lucas Parizek, State Secretary of the Ministry of Foreign and European Affairs of the Slovak Republic; Peter Kmec, Slovak Ambassador to the U.S.; Lillian McEnany, FOS Secretary; Pavol Demes, Transatlantic Fellow, the German Marshall Fund–Bratislava. 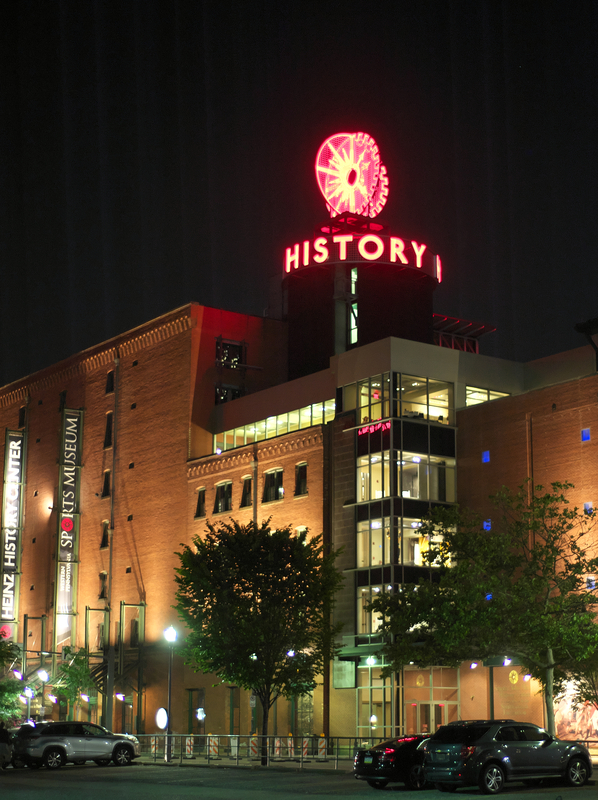 This entry was posted in Events and tagged AFOCR, ambassador, anniversary, consuls, Czech, foreign policy, gala, independence, international relations, Pavol Demes, Peter Kmec, Pittsburgh, Rick Sebak, Slovak, slovakia, speech, Thomas Masaryk, Tod Sedgwick, World War I by Shawn Janzen. Bookmark the permalink.